If approved, the majority of the increased volume of oil transported through the expanded pipeline will be destined for overseas markets. The Trans Mountain Pipeline makes over 700 water-crossings in British Columbia, including over 80 within the Lower Fraser River Watershed. Also, the oil tankers travel through the Burrard Inlet. Vancouver has a significant presence in this watershed, bordered in the north by the Burrard Inlet and in the south by the Fraser River. If approved, the expanded pipeline and tankers will carry both light and heavy oil, including diluted bitumen. Diluted bitumen is a mixture of gas condensate and bitumen from Alberta’s oil sands. Research commissioned by the City of Vancouver also found that the fate and behavior of diluted bitumen, one of the crude oil products carried by an expanded pipeline, pose unique risks to our environment in the event of an oil spill. 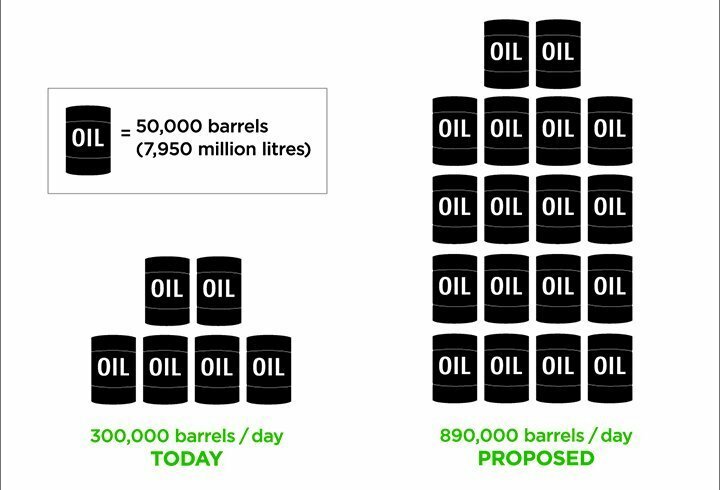 Under the proposed expansion, 890,000 oil barrels will reach BC's coast each day, compared to today's 300,000 barrels. When used, 890,000 barrels of oil would release 56 times more GHGs per day than what's emitted by current daily activities in Vancouver. The number of oil tankers in Vancouver's harbour will rise from 5 to 34 per month. Increased traffic emits greater quantities of air pollutants and increases the likelihood of a catastrophic oil spill. The Burrard Inlet and the Fraser River estuary are some of the most ecologically important coastalmarine habitats along the entire Pacific coast of North America. A major oil spill from a tanker could kill sea and shorebirds, cause substantial numbers of marine life to perish, and jeopardize the viability of the endangered killer whale population. Vancouver and its residents also face the risk of spills from the pipeline and terminals. Oil pipelines can have major breaches as well as slow leaks that may go undetected for considerable periods of time. This graphic shows the history of Trans Mountain Pipeline's oil spills. There have been a total of 81 reported oil spills along the Trans Mountain Pipeline since 1961, on average, 1.53 spills per year. The four big spills highlighted took place under Kinder Morgan Canada's ownership. Research commissioned by Vancouver Coastal Health found that oil spills around the world have had significant short and potentially long-term impacts on the health of people and their communities. Read the report to learn more about these impacts, mitigation measures, and implications for public health planning and research. Real estate development, the tech and film sector, hospitality and ocean-based industries such as fishing, shipping, cruise ships, floatplanes and tourism, rely on the natural environment to support their brand and business activities. Together, these industries employ more than 320,000 people in the Lower Mainland. The construction of the new pipeline will create temporary jobs along the pipeline route and Westridge Marine Terminal. Trans Mountain Pipeline ULC has estimated that on completion, there may be a total of 90 permanent jobs in BC and Alberta to operate the pipeline. This is a small number of jobs in comparison to those provided by sectors reliant on a clean, green, and sustainable coast. Trans Mountain Pipeline ULC estimates that its proposal would create $23.2 million in BC tax revenues over the project’s 20 years of operations. The Burrard Inlet and Fraser River host many migratory birds, shellfish beds, and sea animals, and are habitat of many rare, threatened, or endangered species. Give the Government of Canada your feedback on the expansion project in an online questionnaire. Trans Mountain Pipeline ULC's project will operate when Canadian and global leaders have agreed to reduce Greenhouse Gas (GHG) emissions, in an effort to prevent the earth’s average global temperature from rising more than 2°C from pre-industrial levels. Scientific literature suggests that we are already experiencing climatic changes and over this 2°C limit, it will be difficult or impossible to avoid catastrophic climatic changes. Expansion of the pipeline and the Westridge Marine Terminal would allow for 590,000 additional barrels of oil to be burned in foreign markets each day. The GHG emissions associated with using all the oil shipped in less than one week are the equivalent of all emissions in Vancouver, including all the vehicles on the road, for an entire year. This is based on the City's calculations for the Greenest City 2020 Action Plan (4.7 MB).